Strong support was seen for the SheepConnect SA Farm Innovation days held across the state in early April with over 250 producers attending the four events. The Farm Innovation Day, supported by Australian Wool Innovation Ltd (AWI) and SheepConnect SA focused on taking the hassle out of sheep for the sheep farmer and increasing profits within the sheep business. Events were held on host properties which had recently undergone a shearing shed or yard upgrade. The host properties were turned in to field days sites with a wide range of sheep handling equipment, static displays and quality speakers on offer. Brendan Loechel, Magnus Australia, said in his presentation, "You wouldn’t attempt to put in your crop using a 1920’s tractor and plough, so why do we put up with tumbling down infrastructure and outdated technology in our sheep enterprise?." Producers were given the opportunity to view, a variety of different working demonstrations of sheep handling equipment and products that could offer labour saving solutions in their sheep enterprise. Demonstrations varied from site to site but included the Gallagher auto drafter, Leader electronic tagging, Racewell sheep handler; Magnus Australia shed and yard designs, Sapien Technologies animal management software and Peak Hill Distributer sheep handler. The Electrodip, an auto jetter for flies was flown in from New Zealand for the events. Researcher Robin Dobos from DPI NSW provided the latest information on tracking collar research. Producers also viewed static displays from AWI, Elanco, Biosecruity SA, Landmark, Elders and Natural Resource Management Boards. Further events are planned for the Eyre Peninsula on Wednesday 10th October on Barry Smith's property, Yabmana (near Cleve) and 11th October on Joe Dahlitz's property, Cummins. 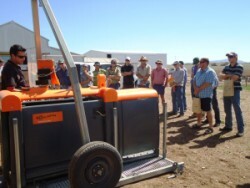 Gallagher rep, Matthew McLauchlan demonstrates the Gallagher autodrafter at the Murray Town SheepConnect SA Farm Innovation Day.